Forget the next Mayweather match—sarcastic fringehead fish battle it out several times a day, and always without a six- or seven-figure paycheck. According to the Aquarium of the Pacific, these ambush predators and elongated “blenny” fish typically don’t grow longer than 10 inches, but are “fearless and extremely aggressive”—attributes which (in addition to the fringe-like appendages over their eyes) led to their pretty intimidating name. Found along the Pacific coastline at depths of from 3 to 73 meters, fringeheads find shelters to occupy and will pop out and envelop passing prey in their proportionally huge mouths. The fish will inhabit naturally occurring niches on the ocean floor, but will also happily move into empty snail and clam shells, another fish’s abandoned borrow, and even cans and bottles that litter the neighborhood. “They aggressively defend [their] shelters by lunging at anything that approaches, snapping open their capacious mouths. 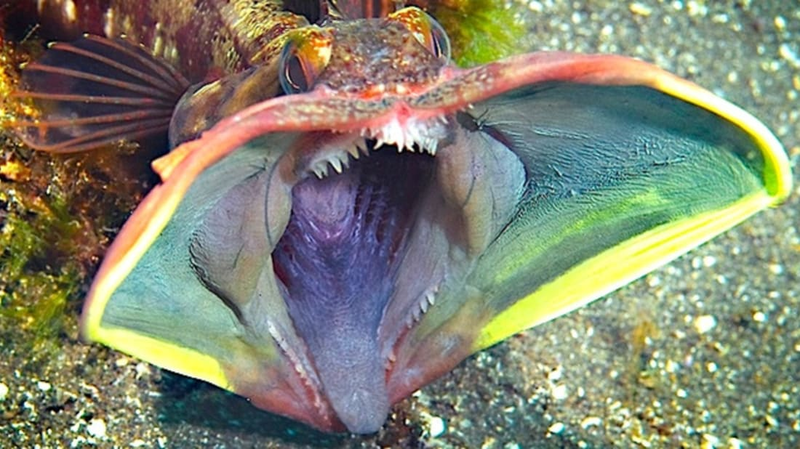 When the intruder is another fringehead looking for a new shelter, the two individuals often enter into a ritual of 'mouth wrestling' with their sharp teeth interlocked ... and the larger of the two individuals inevitably wins the battle and takes over the shelter." Sarcastic fringeheads don't tend to pick their battles carefully, either. Denny and Gaines also wrote that "due perhaps to poor eyesight, an inflated perception of their own bulk, or both, the fish appear incapable of accurately evaluating the size of another individual until they begin to wrestle." These two brawlers seem like a decent match-up, though.